How many days of lost productivity would your business suffer if you experienced a fire in your server room? How catastrophic would it be if a fire destroyed irreplaceable records and documents in the storage room of your corporation? What would happen if a data center went up in flames and many years of data were unrecoverable? D&M Fire and Safety Equipment offers Amerex CPS Clean Agent Fire Suppression System utilizing FM-200®, the most trusted waterless fire suppression agent in the industry. Years of proven Amerex innovation plus FM-200 equals CPS, a cost effective, reliable, waterless fire protection solution for your critical data and sensitive electronic equipment. Finally, CPS is the solution customized for your needs. Amerex CPS Stands Out: Clean and Simple At the core of the Amerex CPS is FM-200, a waterless clean agent that puts safety first—safe for you and your people, safe for your delicate electronics and data, and safe for the environment. 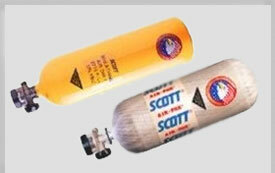 The EPA has approved FM-200 for use in normally occupied spaces as a safe and environmentally friendly clean agent. In fact, more large data centers and telecommunication sites are protected with FM-200 than any other alternative agent. Amerex CPS was developed so installation could be simple and efficient. The complete system, including smoke detection with alarms, is modular to assure simple and trouble-free wiring for the installer. Innovative concepts in the design provide flexibility in tank and nozzle locations removing design and installation challenges often encountered with other systems. The clean and simple Amerex CPS FM-200 system is the perfect solution for you if loss of data, equipment, or other critical assets could result in lost business. 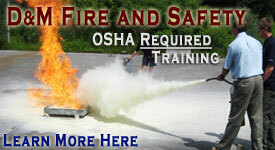 D&M Fire and Safety Equipment offers the exclusive Amerex CPS, which stands for Clean Agent Pre-Engineered System. The Amerex CPS is a carefully developed fire suppression system designed to help companies maintain business continuity and protect irreplaceable, critical assets from the risks of fire without putting people or the environment at risk. 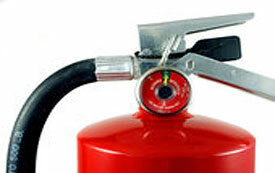 The agent used in this unique system is the industry leading FM-200 Waterless Fire Protection, an environmentally friendly clean agent manufactured by Great Lakes Chemical Corporation TM, a wholly owned subsidiary of Chemtura Corporation. FM-200 was selected as a top product for 2005 by Buildings Magazine for its ability to stop a fire within seconds with no water or collateral damage while still being safe for sensitive electronics and people. Unlike a sprinkler system the Amerex CPS uses state-of-the-art smoke detectors to detect smoke long before the fire reaches the high heat levels necessary to trip a sprinkler. After confirmation of a fire by a second smoke detector, FM-200 discharges into the room reaching the design concentration within 10 seconds. Quick detection and suppression occur before the fire reaches catastrophic levels. And no water to clean up after the fire so you can be back in business with minimal down time. 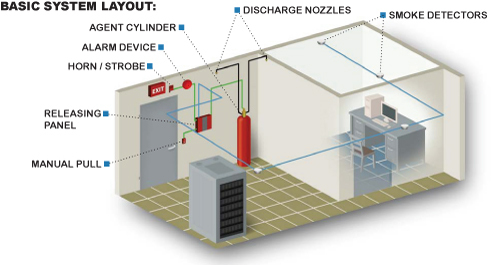 With the addition of the Amerex CPS system to your total fire protection design you will be providing early detection and rapid fire knockdown in seconds. Now you can rest assured that your critical assets have complete and total protection. The new Amerex CPS Clean Agent Fire Suppression System is finally here to create a unique and customized total fire protection system to protect your critical assets. Call today to schedule a consultation about how you can incorporate the Amerex CPS System into your business strategy so that your business will stay in business—and you can have peace of mind. FM-200 is a registered trademark of Chemtura Corporation or one of its subsidiaries.